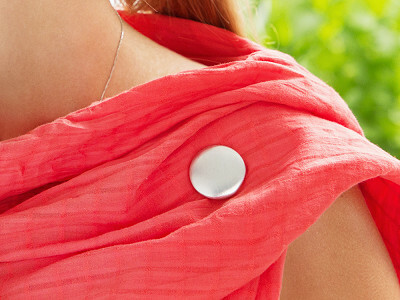 Maggies are ultra-strong clothing magnets that hold scarves, sarongs, jackets and more in place without damaging the fabric. (We like using them to hold curtains and tablecloths in place, too.) Founder Maggie Sinclair came up with the idea after wearing a sarong. The only way she could keep it secured was to bunch it into a knot. 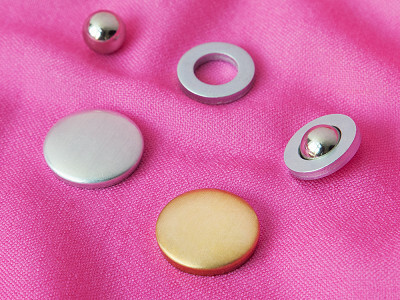 A magnetic ball and a metal ring gave her the inspiration for a new kind of fastener. 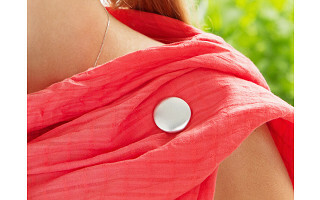 Maggies clothing magnets are better than safety pins because they don’t puncture fabric—or skin! They’re removable, reusable, and versatile. Hide them inside your clothes or wear them showing. 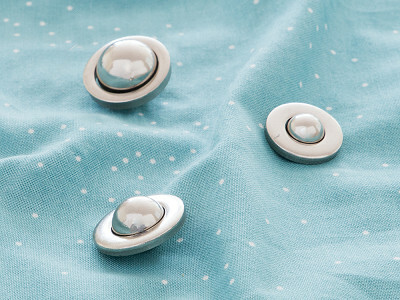 The combo version comes with decorative covers for the magnetic balls (which Maggie calls “Fashion Plates”), turning them into silver or gold button-like accessories. Using Maggies takes a bit of practice because the magnet is so strong. But once you get the hang of it, you’ll be happy to leave those pins and knots behind. Hello everyone! I'm proud to introduce Maggies to The Grommet. I'd be happy to answer any questions you have about our magnificent little fashion magnets. These look awesome and very stylish. Are there plans make other fashion plate colors like black? Great question! Rose Gold tone would be great too! Hi all, it's certainly possible! Margaret mentioned below you can decorate the existing ones if you'd like. Will the magnet erase the credit card if I put it in purse? Yes, I just read under this item's details that neodymium magnets are used. They may not be of concern, in general, it's just that you never know who you might come in contact with and they could have a pacemaker. Hi Dana, thanks for the comments! You should have no trouble with pacemakers, but you should always consult with a physician to be sure. Hi Jing, you should also have no trouble with credit cards as it depends mainly on the duration of the exposure. Because your CC will likely not be in close contact with Maggies for a long period of time, it will no be affected. @Mike Reread Jing's question ... it was about putting the magnet in her purse, where it most certainly could be close to a credit card for a long time (especially if the card is in some of the minimal wallets you sell). Hi Jim, good catch. Yes, if it is in your purse, it can be an issue. It'd be best to wear it on an article of clothing as intended to avoid any problems or make sure it is safely away from any CC's. P.S. Credit Cards is an authoritative site at which a physics professor talks about magnetic money clips and even magnetic purse clasps erasing credit cards, so these magnets certainly could if put in a purse. Right! It's best to keep Maggies on your clothes. If you're going to put them in your purse, know that the risk increases. I like this.....How big are the Fashion Plates? @Susan If you click on the "Buy" button it (almost) always gives the types of details (weight/size/etc.) you are asking about. They are .75" x 0.4", Susan and Sheri! How heavy are they? Will its weight carry lightweight scarves downward? Hi Karen, they weigh .044 lbs. you should have no trouble with lightweight scarves! Love the idea! I can see a desire by many for different colors and even cute, fun shapes for future Maggies. Even some that would look like a brooch would be great! Any plans for this down the line? Cynthia, Maggies are designed to be hidden when worn with scarves, etc. and the Fashion Plate covers worn when they need to be seen such as when used as jacket closures or altering hemlines. Do check out the video's below to see all the ways you can use them with different size and shaped scarves and shawls. How do you use the magnet to not show? Cool idea, but appears to be outside of my budget - is that two magnets for $25? Do you sell them individually? How many come in the Combo Pack? Debbie, for some of the looks you will need two magnets and both sizes that come in the Twin Pack are very useful with the smaller one for the lighter weight fabrics and the larger for heavier weights and multiple layers. The power of the magnet is what makes this product successful and is what you are paying for. This is a small price for something which will become a wardrobe staple and will be used over and over again with every outfit and will not wear out. I'm so happy that you like Maggies. They are very powerful spherical magnets and are functional rather than decorative and therefore not meant to be seen. The ring and magnet combo are really meant to be hidden and not detract from the scarf or sarong. The Fashion Plates are a recent addition which allows Maggies to be seen as jacket closures or for shortening hemlines, etc. At the moment the Fashion Plates in the Combo Pack come in 2 silver and 2 gold and are plain so as not to clash with jewelry. @MARGARET I need an answer to the credit card issue. You'd have to be very careful where you put them if you might erase your companion's credit cards or hotel room key. If they do, what would be the range? You could walk down the street in New York and wipe out a bunch of people's magnetic strips. I want a set for a friend coming in from Europe, wouldn't want to ruin her ATM card that far from home. Cornelia, I carry these magnets in my bag all the time along with my credit cards and it has never been an issue. They do not set off alarms at the airport either so I doubt you could do the type of harm you are fearing. Hi Cornelia, you're right you would have to be careful where you put them! As long as you are not exposing your CC to Maggies for an extended period of time, you won't have any issues. It's the duration of the exposure, not the strength of the magnet that causes trouble. Maggies also will not a create a forcefield of magnetic havoc as you walk down the streets. Citizens of New York and your friend from Europe will have fully functioning credit cards as long as you are not holding the CC's directly to the magnet! Nice, but really - $25 for a magnet? Go to JoAnns and find magnet closures for $2.49. Kathleen, you certainly can get magnets for less but it is important to realize the value of power and that is not to be underestimated with Neodynium Magnets. No other magnets will hold multiple layers of fabrics for long. Not just a fancy magnet, Elizabeth. A fancy Neodynium magnet! You won't find many magnets that can hold clothing for as long as these and even fewer that look as nice. Not to mention you are supporting an independent and underrepresented Maker. That's a win all around! 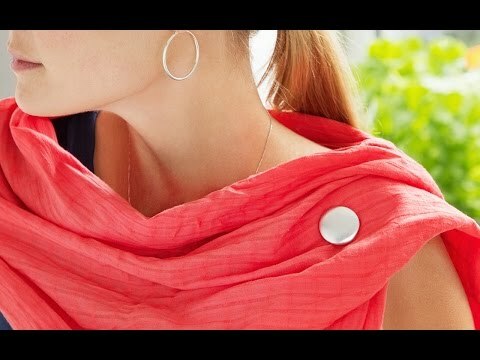 Would love a black or gray button color magnet cover, that is even more discreet. I wear a lot of these particular colors. Love your idea a lot though! @Mary Kaye spray paint them. Mary Kaye, the Fashion Plates can also be decorated with glue and bling to suit your wardrobe. With regards to pacemakers, as a cardiac surgery nurse,it should be noted that it takes a positive and negative magnetic pole to alter a pacemaker and my very close friend had a pacemaker and was in very close contact with Maggies. It is always advisable for people with pacemakers to check with their physician before wearing magnets of any description. Clearly, being a cardiac surgery nurse does not require an education in basic physics. Every magnet has two poles -- north and south, not positive and negative. Here's a site from a magnet manufacturer with information and a distance chart concerning neodymium magnets and pace makers. Jim, I think we can allow for a basic slip especially when it does not alter the efficacy of the content. The north and south poles of a magnet work similarly to that of a positive and negative charge in an electrical current. Positive or negative, north or south, the decision for use of Maggies with a pacemaker should be made by a physician. Can I safely take off Maggie's from thin knits and scarves? Certainly Pat but with very fine fabrics it helps to push the magnet out through the ring. It should be noted that with coarse weave fabrics that you could put your fingernail through you could expect the fibers to separate in the same way. Maggies work best with fabrics which conform (like knits or tight weaves) rather than very stiff fabrics like heavy denims or canvas. With all fine fabrics they should be handled gently and not roughly pulled apart. Please check the video's Ellen - there are countless ways. I'm sure you will even come up with new ways yourself. I see that these are nickel-plated. Please consider a non-metallic coating for those of us allergic to a variety of metals. I really like this idea. Hi Cheri, I am allergic to nickel plated jewelry too but have not had a problem - probably because they rarely come in contact with skin for any period of time or maybe it is a different type of Nickel. However, there is a great product which The Grommet carries which is amazing when sprayed on any jewelry. It is called: ALCHEMY and it really helps with Nickel allergies. And you can find that here! While this product appears beautiful and very useful, I am concerned about the safety of 'Maggies'. It's stated the magnets are very strong- is there any safety concerns regarding a child (of any age) swallowing the magnets? There have been many tragic events with children and magnets, just a thought. True Sara, at one time there was a children's toy made from magnets. It is important to note that for problems to occur it is necessary to swallow more than one magnet. WE STRONGLY ADVISE THAT ANY SMALL PART SHOULD ALWAYS BE KEPT OUT OF REACH OF CHILDREN. Are these magnets strong enough to use as a fastener on a leather bag? Ruthanne, Maggies are not efficient on very stiff fabrics like leather because the thickness of the leather does not allow the curve of the magnet to enter the inner side of the ring. Though it might work on supple leathers like lambskin which is soft it is not normally effective on the heavier weights that bags are made from. What a great solution! I've been trying to come up with a way to nip and tuck my clothing for some time and I think you've hit the hammer on the "grommet" for me, pun intended. I do think the price is fair and look forward to other options you provide in the future. Best Wishes on great success! Irma, Lots of photo and dance studios are using Maggies for that purpose .... just not sure how long they will hold still for long periods of activity. Hi Phyllis, we understand Maggies might be out of the budget for some and we don't want you breaking the bank. But these aren't cheap magnets, they're fashionable and high-quality which is where their value is. Have you thought about magnetic jewelry pins and broaches for woman's business suit jackets? I just cringe at putting a hole in my expensive suit jackets, just to dress them up with a broach. I'll let Margaret provide details on future products, but that is a great idea, Claudee! Hello Claudee, Maggies business model is for functional patented products only and I will leave the jewelry aspects to those companies who specialize in that. I am sure that there are many magnetic jewelry pins with amazing designs already on the market. What an absolutely creative and wonderful idea! Terrific! 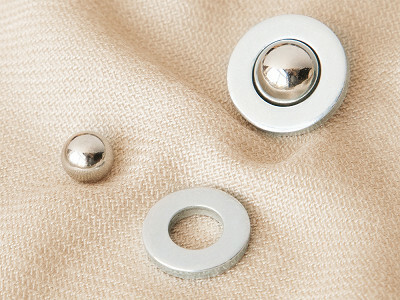 The first MAGNETIC TEXTILE FASTENER since the SAFETY PIN was patented in 1849! I'm confused about the sizes in the Combo Pack--Under Details, it says the Pack contains 2 1/2" Maggies, but then under Dimensions it gives two different sizes-- 0.5" for a mini Maggie, then 0.75" for a Midi Maggie. So are they both the same size, or different sizes? That sizing is always an issue when you have to describe 2 items in a box. The box size is 2.5" and there is a 3/8" and a 1/2" magnetic sphere with a ring around each one! I hope that I haven't confused the issue even more for you! These magnets look like the perfect solution for my need to keep the neckline attached to the bra strap for dresses that have too wide a neckline. But I don't see a description for that need. Do you have any suggestion? Could I use tape.thread or lace of some kind to keep the lower magnet lined up with the bra strap? What is the outer diameter of the ring shaped magnet. Hi Elizabeth, it sounds like it could work for what you are looking for. The ring's diameter is an inch so it should work to keep it lined up. Of course, throwing in tape thread couldn't hurt!